When I was cooking tonight, my favorite song "Down on Me" by Jeremih and 50 Cent came on the radio. This definitely was the highlight of my night, my boys and I went crazy dancing. All I have to say is, thank g-d my kids are too young to understand the words or learn the lyrics. How embarrasing would that be for them to go to preschool singing this song? In order to equal out the bad music, we listened to the Music Together C.D. while they ate their dinner and I finished cooking our dinner. I made the boys a seperate dinner tonight (something I don't normally do) because I wanted to them to go to bed earlier. Lately, they've been staying up too late, which in turn makes them sleep late, and then they are late for school. They had dinosaur chicken nuggets, tator tots, apple slices, cucumber slices, and ketchup (in case you were wondering). Chicken Mish Mash Soup, Grilled Lemon Asparagus, and Everything but the Kitchen Sink Salad. Chicken Mish Mash Soup is chicken soup with rice, noodles, matzah balls, and usually kreplach. It is very filling, as it always seems to expand in your stomach. The Grilled Lemon Aspargus were yummy. I got a recipe from my mother in law for Aspargus and Goat Cheese Salad with Grilled Lemon Vinaigrette. I altered the recipe to make it into a side dish with just asparagus instead. I will definitely make the salad version of it soon. 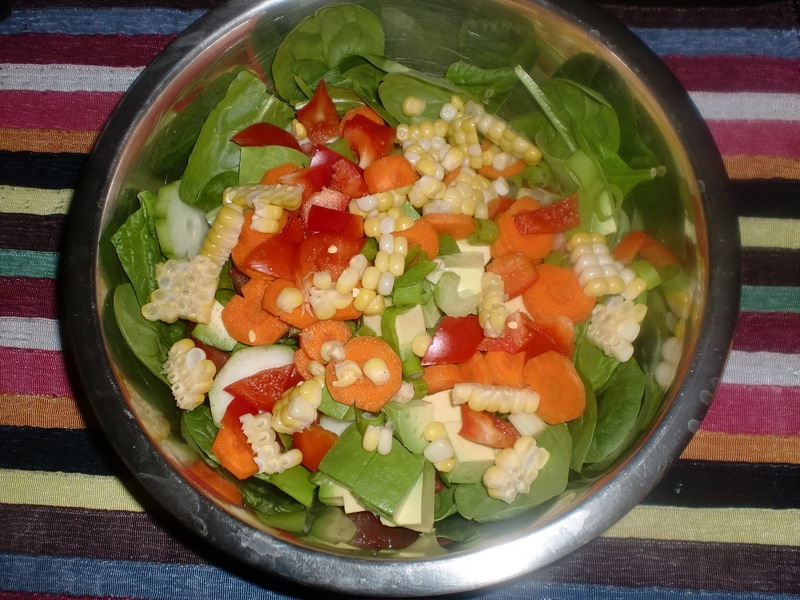 Finally, the Everything but the Kitchen Sink Salad, was a green salad with spinach, tomato, cucumber, corn, avocado, bell pepper, celery, carrots, and green onions. 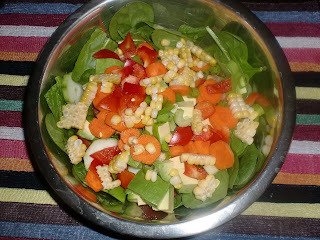 It looked like a rainbow in a bowl, a shining picture of healthiness. This can be tailored to however you like it. I used a homemade dressing, but a bottled one would be good too. Prepare the grill, or heat a grill pan. Brush the lemon slices with olive oil. 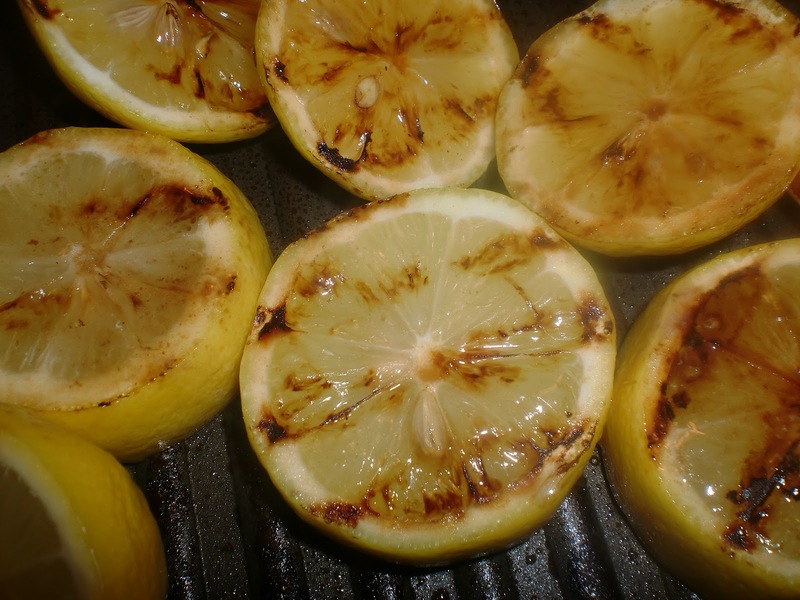 Grill the lemon slices until lightly carmelized on both sides, approximently 3 minutes. Preheat oven to 400 degrees. Place the asparagus on a baking sheet. 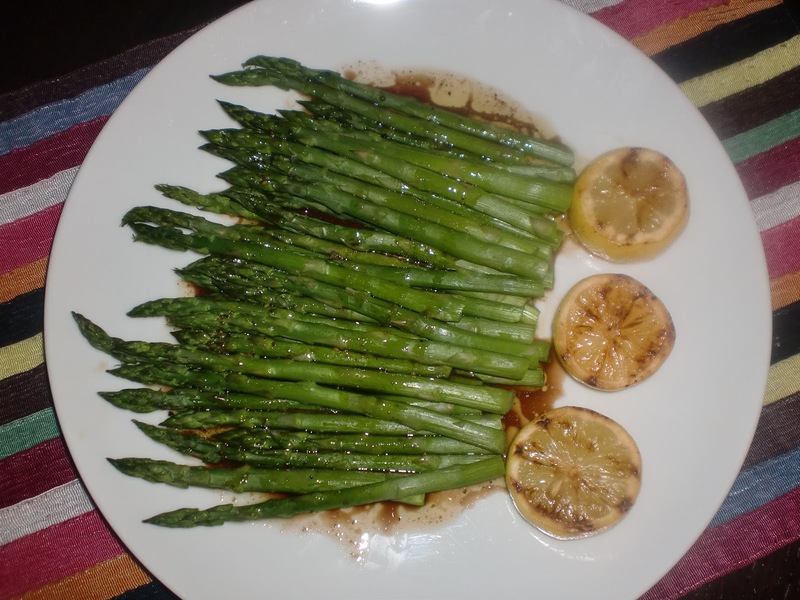 Roast the aspargus for 7-9 minutes depending on the size of the stalks. Place the asparagus on serving platter. Place the other grilled lemon on the platter also. Drizzle the asparagus with some of the dressing. There will be leftover dressing, you can use for a later time. *** Note: If you would like to make this into a salad, the original recipe called for all of the above ingredients plus 1/8 C. slivered toasted almonds, and 12 oz. of spinach or romaine. You would just place the lettuce, almonds, asparagus, and goat cheese into the salad bowl. Toss with dressing. I gotta run, King Hock is having a major allergy attack. I need to go tend to him. He has used almost a whole box of Kleenex.